There are many business terms that come up again and again for business leaders: objectives, bottom line, profit margins, deliverables, project management and many more. These are undoubtedly the financial and organizational building blocks of any successful organization. They represent important ways of assessing performance in different categories. But sometimes, in the pursuit of hitting key benchmarks and goals, it’s easy to inadvertently let the “soft stuff” slip through the cracks. When was the last time you asked yourself whether your employees were, well, having fun at work? Not only is it make-or-break for morale, but its presence or absence can actually impact your bottom line quite significantly. 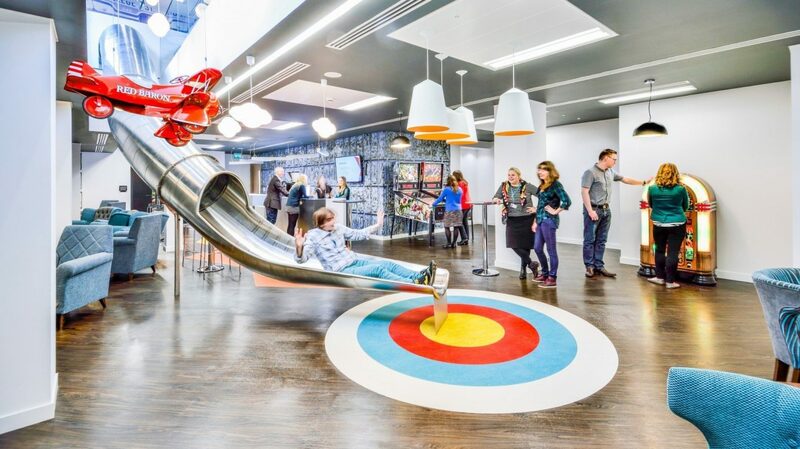 Keep reading to learn more about workplace fun: why it’s important and how to have it. So, not only does fun have the power to outright boost productivity, but it also makes the employee experience more positive—which goes a long way in reducing costly turnover rates and building a company culture in which people actually want to work. It’s hard for employees to feel relaxed enough to have fun in a work environment that feels foreign to them. Sure, new hires meet a parade of coworkers during their first week, but many of those connections won’t stick without a little reinforcement. Make up a title for your autobiography. Rank this list of pizza toppings from best to worst. These lighthearted icebreakers give employees a reason to talk to one another, ask questions and laugh together. These connections can easily carry over to outside the walls of the conference room. Plus, they insert some much-needed life into what might otherwise be a run-of-the-mill meeting. The nose-to-the-grindstone mentality only works for so long before people begin to feel burnt out. For this reason, many companies are incorporating mindfulness and personal development into their regular workflows. There are many ways to do so, but encouraging employees to try yoga, meditation, journaling and paid volunteering are a few. The key here is ensuring “mandatory mindfulness” doesn’t begin to stress out employees who already have a lot on their plates. Make sure you’re truly allowing people to step away from their desks and disconnect. If possible, provide stipends for people to explore personal development and mindfulness within the community, or at least time off. Half of people say that feeling comfortable being themselves at work gives them a sense of belonging. Create a culture of authenticity by encouraging your employees to be themselves. There are small ways to infuse personality into your workplace in a healthy way. Allow employees to decorate their cubicles, offices, lockers or any other personal areas they have within your business. Feature a handful of employees each month on your company portal or in a newsletter, highlighting their hobbies and interests outside of work. Foster a culture of acceptance by making sure your company policies allow everyone to be themselves without fear of harassment or disrespect. Host an optional Halloween costume contest or parade, complete with snacks. Leave space for people to be individuals, even in the context of work. Workplace fun is tied closely to morale, culture and productivity—so don’t view it as an optional attribute; make sure you’re harnessing it to the fullest extent.